Jarvina Routt was born and raised in Southern California where she still resides with her husband and son. In high school she joined the Track & Field team. The coach was upset she chose not to run but instead throw. Growing up the youngest of seven she wanted to do something she couldn’t be compared to her siblings. After lettering all three years she went on to competecollegiality in the discus and hammer. 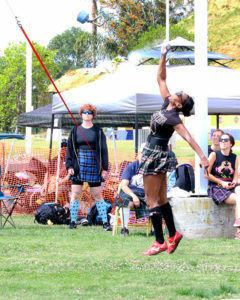 She started her first full Highland Games season in 2016 and fell in love with the sport. After a year of competing at the Women’s A/Elite class she competed in the Lightweight class where she established a new world record in the heavy weight for distance at 51’ 2.75”. Going into her third season in 2018 she has established another world record in lightweight for distance at 72’8 in the Women’s Lightweight class.